My wife Charity left us today. She headed down to Dallas, TX to attend the DIVE Creative worship workshop for a week, hosted by a couple of her heros. Well whoopdeedoo for her, in the mean time I’m shackled to all three kids for seven whole days. In truth I’m super excited for her and am glad to do whatever it takes to make her trip possible. Here is a log of our first day, mostly for her benefit, so she knows that we are going to make it. Woke the kids up, threw on my getting-up-early-and-not-showering clothes, and we dropped Charity off at the airport. I’ll note that she willingly kissed me knowing that I hadn’t yet brushed my teeth. Turns out all I needed was to send her away for seven days to get that to happen. Every Friday is donut day. Today was no different. Oh wait, yeah it was. Nola got car sick while in the drive thru, due to the early morning and long drive to the airport and back. She threw up while the rest of us sat, helplessly watching. Fortunately she hadn’t eaten anything yet so it wasn’t bad at all. That was a surprise pat on the back for poor breakfast planning. Decided to make scrambled eggs and waffles(Eggos, I’m no superhero) for breakfast instead of cereal. Because I enjoy jumping to the highest of heights and feeling the despair as I plummet back down to instant breakfast foods—yes, scrambled eggs is my highest of heights. Nola asks me if I even know how to make scrambled eggs and proceeds to question my methods with, “that’s not how mom does it.” I asked her if that’s how it’s going to be the rest of the week, and advised her to check herself before she wrecks herself. I make my scrambled eggs with cinnamon. Nola didn’t like it, Violet was indifferent, I think it rules. At one point, like in most conversations, we started discussing intestines. They are about 20 feet long. Counting that as science for school. Shut the refrigerator door and clipped Roman’s head. Apparently he’s tall enough for that now. That’s usually the only way to find out if your kids are tall enough for something. Put Roman down for a nap. The three become two. It’s like heaven. We have a drawing prompt book. It said to draw a song being sung around a campfire. Violet drew a monster and started singing a song that we wrote about monsters. Both girls proceeded to sing it for 15 minutes straight, well basically just the chorus. It’s this song. It was really cute. Roman wakes up. See ya later heaven. Take the kids to the bank to deposit a check. We are ready to go inside and I realize I forgot Roman’s coat and Nola didn’t bring hers. Violet responsibly waits for us, in the warmth of her coat, to search the van for spare coats. No dice. No one tell my mom her grandkids were without coats at one point in their lives. Nola chats with the banker about the banker’s Betta fish. The banker says she just cleaned the bowl and Nola proceeds to inform her about a product with a tube and a jar that can keep the fish bowl clean. You know, just talking shop. Apparently she saw a commercial. We go to the store and ran across this. 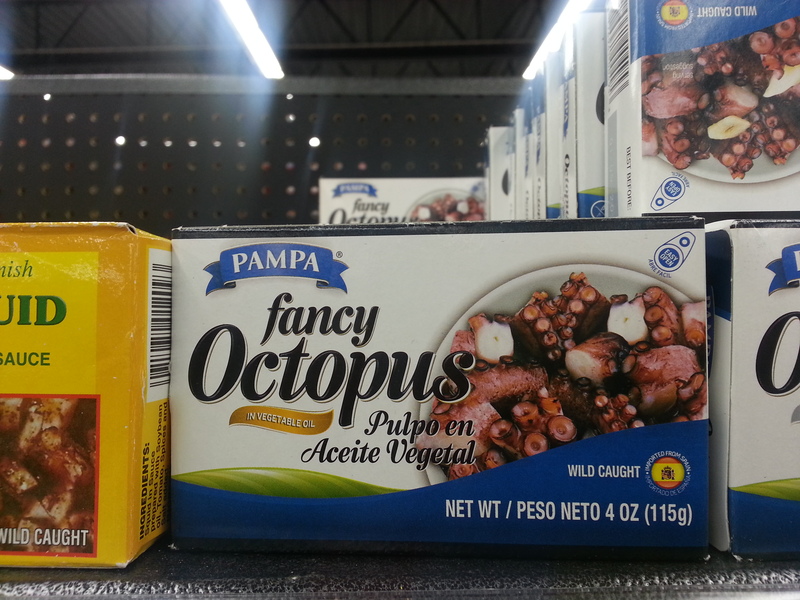 When regular octopus just isn’t elegant enough. I bought it for all of us to try as an adventure. Finally leave the store. 70% sure I have maybe a meal or two that I can put together in the sacks I’m carrying. We all tried the octopus after lunch. Had them take at least three chomps before they spit it out. It took some encouraging and they did it. They said it tasted like dog food. I didn’t mind it, as I like calamari. Buying something gross and trying it may be a new thing. Put Roman and Violet down for naps. This must be what Charity refers to as, “The deliciously wonderful time of magical quietness and peace.” At least that’s what she should call it. Roman was the last to wake up. Started coughing a lot. He destroyed his diaper then coughed himself into throwing up his lunch while on the potty. Yay! I get the full experience. Gave him a bath. Started making Mac & Cheese with hot dogs, because I’m a grown man with children. A hungry Roman gets a hold of our brand new box of Crunch Berries and dumps them all over the floor. We all mourned each and every unrecoverable piece. You will be missed. Got all the kids in bed, kicking my feet up, and trying to remember a time before Charity left to go to Dallas, TX. I love you Ryan! OMG this was great. Don’t worry you all made it alive that’s what counts. HAHA! I always knew you were a rock star. It is now proven. I am only 5.5 hours away as an emergency back-up plan, by the way. That is closer than Texas. Oh my gosh I am laughing thru this, I can vividly see it clearly happening. Sounds like you made it!!! Day 2 should be a blast!! Great job on the Octopus I would not of done it!!! oh, Ryan. You make life such a delightfully, memorable thing. There is no shame in giving your children hot dogs and Mac and cheese when your spouse is away. Those two weeks Jason was gone in Sweden/Denmark? Oh yeah. I totally did that. Except I made it two meals — hot dogs one night (we probably had applesauce with it) and Mac and cheese another night (maybe with some frozen veggies?) Zero shame.